The Corridor Section Editor is a powerful design tool. 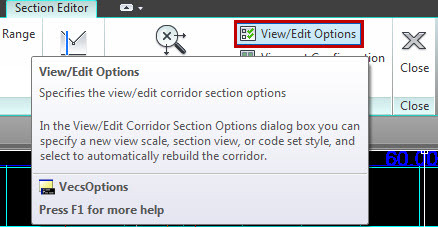 It provides the ability to view and edit a Civil 3D corridor by displaying a step by step walk through of cross sections in a model. 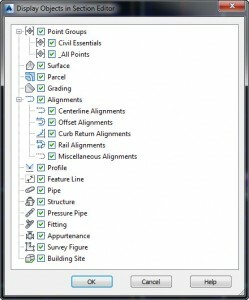 Here are a few tips to help you take control over the display and user interface of this tool. 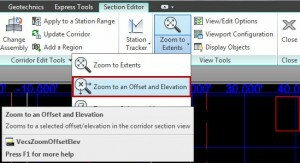 Many display settings can be accessed by selecting the View/Edit Options button on the Section Editor tab of the Ribbon. One UI feature of the Corridor Section Editor is the Adaptive Grid. This feature dynamically adjusts the frequency of the horizontal and vertical gridlines when zooming in or zooming out inside a section viewport. 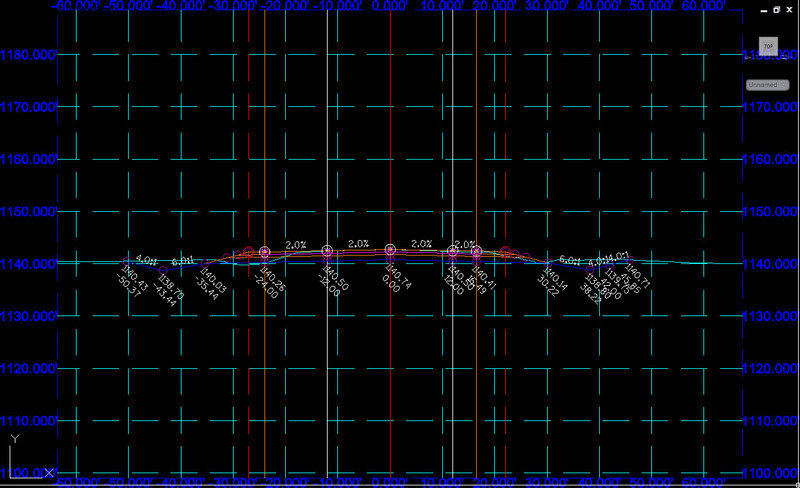 This behavior can be turned off to force the gridlines to display at a static interval regardless of zoom level. Select the View/Edit Options button on the Section Editor tab of the Ribbon. The View/Edit Corridor Section Options dialog will display. 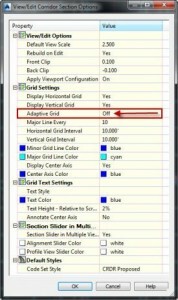 Set Adaptive Grid to Off. 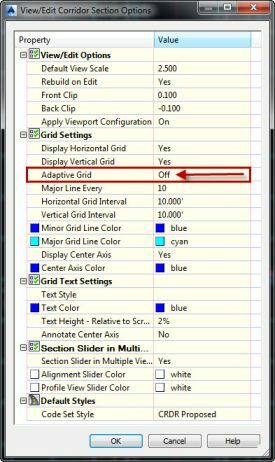 Many other display settings can be controlled through this dialog box such as color, text, and Code Set Style display. 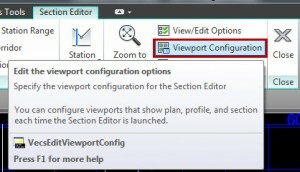 Another display item that can be controlled is viewport configuration. Viewport configuration can be accessed by selecting the Viewport Configuration button on the Section Editor tab of the Ribbon. 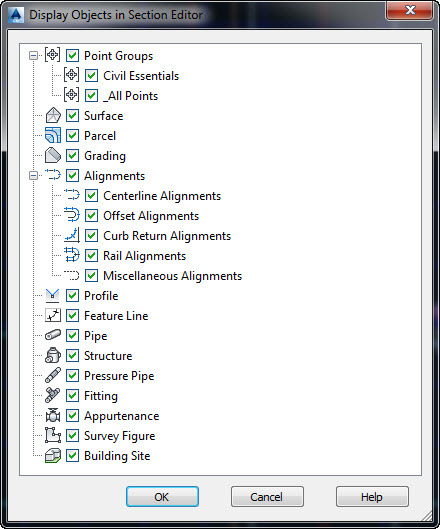 In the Corridor Section Editor: Viewport Configuration dialog there are settings for number of viewports, size of viewports, and what is displayed in each viewport. 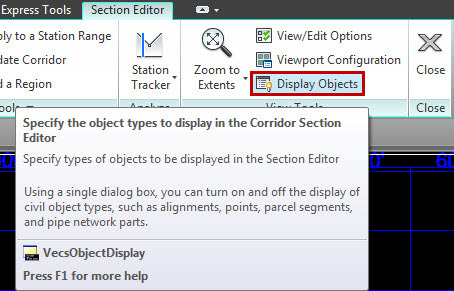 We can also control what is or is not displayed in the section view by selecting the Display Objects button on the Section Editor tab of the Ribbon. 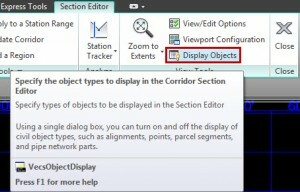 The Display Objects in Section Editor Dialog controls which objects from the model are shown in the section editor. Items can be checked/unchecked to control display. Zoom Control: To keep the section viewport from zooming to extents when cycling through sections, center your section in the viewport, zoom to your desired zoom level, and select Zoom to an Offset and Elevation from the Zoom dropdown on the Section Editor tab of the ribbon. Grid Linetype: You may open the Corridor Section Editor to find the grid showing as a dashed line or some other undesired linetype. This can be easily fixed. The viewport grid inherits it’s linetype from the current layer. Close the Corridor Section Editor. 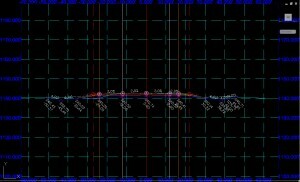 Change the current layer to one that has a continuous linetype. Reopen the editor and the gridlines will appear continuous.